SWEET & SALTY TREATS: 50 carefully selected snacks will help crave your sweet tooth and stop that hangry feeling. Candy, chips, cookies and chocolate are great to throw into bagged lunches. COLLEGE SUMMER FINALS 2018: Great for college and university students studying for final exams. Gives an energy boost for late night sessions and all day studies so your student can ace their test. Perfect for guys, girls, teens, kids, or just about anyone! DORM ROOM ESSENTIAL: Great for picky college students who are on a budget. This 50 count box will hold them over just long enough until you send them another care package. 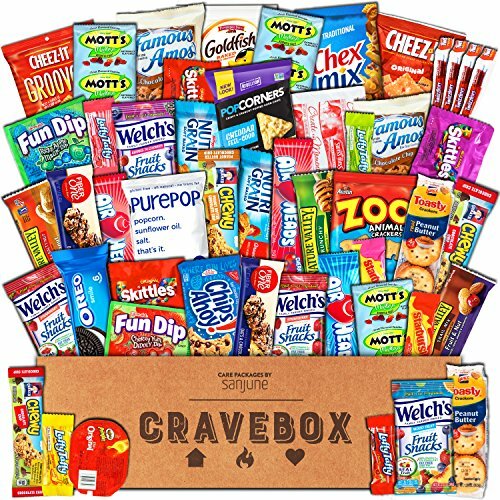 BRANDS YOU KNOW AND TRUST: A variety of big brand names in their factory sealed packaging ensures freshness every time you open a snack from your CraveBox. GIFT PACKAGING INCLUDED: Each box is carefully packaged with 50 snacks and then topped with white gift wrapping paper for that special snacker in your life. Box measures: 12.5 x 9.5 x 4 inches.